A disability services workshop, aiming to better inform primary school families of the help available to them, has launched in Casey and Cardinia. Helping Hand, a workshop started by disability consultant and Berwick mum Michelle Jankovic, will help parents and carers get directly connected with the local and state disability services that they may not be aware of. Michele, whose 11-year-old son Bailey has mild cerebral palsy, found it difficult to find extra support for her son once he entered primary school. This prompted her to provide support for other carers who are unaware of the services available. “In early intervention groups, you’re connected with disability centres, but once your child joins a school, I found there was no one to provide me with more information on support,” she said. Michelle is encouraging schools to invite her to hold discussions with parents and carers and make them aware of what support was available and where to find it. Michelle has spent the last four years planning for Helping Hand by holding talks with schools. She is currently developing an online directory she hopes to launch soon, and refining a medical organiser to be handed out to parents and carers. “All the principals I’ve spoken to 100 per cent agreed that there was a need for this type of workshop,” Michelle said. “I find that if families are fully aware and supported and connected to all services that they can apply for, that builds strong families. City of Casey deputy major Amanda Stapledon and La Trobe MP Jason Wood have also thrown their support behind Helping Hand. 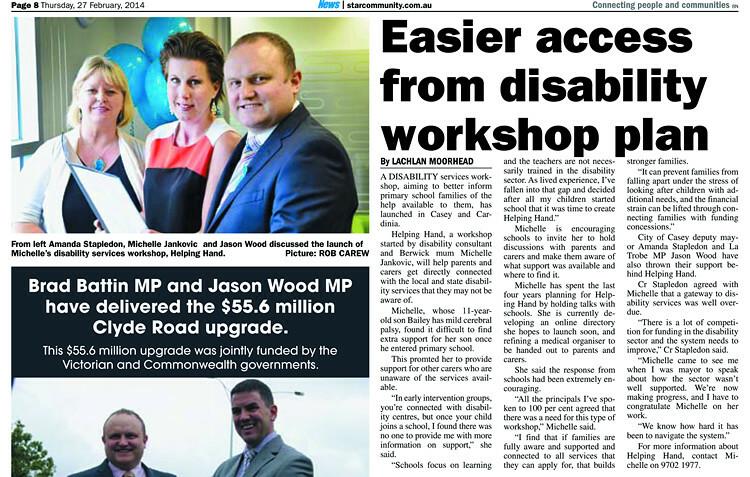 Cr Stapledon agreed with Michelle that a gateway to disability services was well overdue. “There is a lot of competition for funding in the disability sector and the system needs to improve,” Cr Stapledon said. “Michelle came to see me when I was major to speak about how the sector wasn’t well supported. We’re now making progress and I have to congratulate Michelle on her work. For more information about Helping Hand, contact Michelle at michelle@helpinghandishere.com.au.